Serving up a quick, effective mantra custom made for nurses. Don’t miss out! 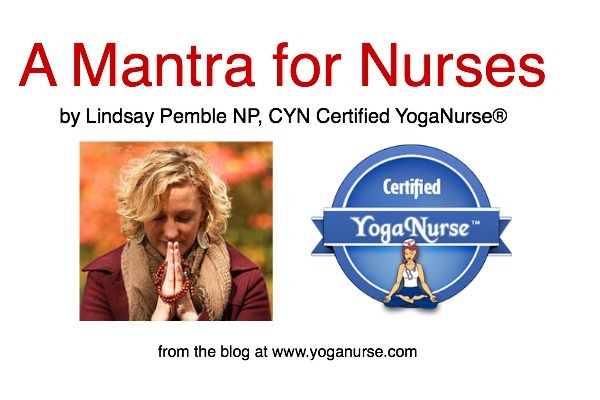 Created with love by Certified YogaNurse®, Lindsay Pemble, Cardiac Nurse Practitioner. CLICK THE ORANGE PLAY BUTTON. GET A MINI RESTFUL RETREAT NOW! Our YogaNurse team truly hopes this serves you, lightens your heart and feeds your soul. Do you feel more at peace, calm, rejuvenated? LEAVE A COMMENT BELOW pretty please. We want to know if this mantra helped you. With big, bountiful LOVE from our YogaNurse Team. Thank you Lindsay, a much needed and early reminder, to take a moment, pause and remind ourselves of our own self-worth, service to others that we provide, and need for self-care. We are much aligned. Thank you!